Three-time Pro Bowl safety Jairus Byrd has 256 tackles, 22 interceptions and two touchdowns in five seasons. BUFFALO, N.Y. (AP) — Three-time Pro Bowl safety Jairus Byrd has already begun attracting plenty of interest before the NFL’s free agency period opens. A person familiar with discussions told The Associated Press on Monday that the Cleveland Browns, Miami Dolphins and St. Louis Rams are among a number of teams that have expressed interest in signing Byrd. The person spoke on condition of anonymity because talks have not been made public. The person revealed those three teams specifically as having contacted Byrd’s representatives since Saturday, when the NFL allowed discussions to begin with prospective free agents. Teams aren’t allowed to sign players until Tuesday afternoon. 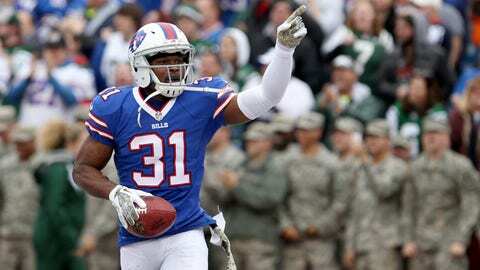 Byrd is among the top defensive backs set to hit the market after a solid five-year stint with the Buffalo Bills. Buffalo chose not to apply its franchise tag and retain Byrd’s rights for a second consecutive year. Byrd’s asking price is projected to be high after he elected to test free agency by choosing not to accept a lucrative offer from the Bills. Two people familiar with a portion of the Bills’ contract offer said Byrd stood to make about $30 million over the first three seasons of a multiyear deal. The full length and value of the contract — including guaranteed money — were not revealed. Despite the Browns’ struggles on and off the field, Cleveland is regarded as a potential landing spot for Byrd because Mike Pettine was hired as coach in January. Byrd enjoyed playing under Pettine, who was Bills defensive coordinator last season. Byrd is capable of playing either safety position, which fits Pettine’s defensive philosophy that puts a premium on player versatility. The Browns have a potential opening at safety, with T.J. Ward eligible to become a free agent. Cleveland can also afford Byrd’s asking price with the team nearly $50 million under the salary cap. The Rams need to improve their defensive backfield after they manned their safety spot with fill-ins last year. The Bills still haven’t ruled out Byrd returning. That prospect appears less likely after Buffalo turned its attention to signing fellow starting safety Aaron Williams to a four-year, $26 million contract extension last week. Byrd earned his third Pro Bowl selection last year despite missing a majority of the offseason before accepting the team’s one-year, $6.9 million franchise tender in mid-August. He then missed the first five games of the season with plantar fasciitis in both feet. Byrd still finished tied for the team lead with four interceptions, and added a sack and a forced fumble. Overall, the 2009 second-round draft pick out of Oregon has 22 interceptions and 11 forced fumbles in 73 career games.